Prague has a rich and well-working public transportation system where you can choose between buses, trams, metros and an enjoyable funicular. 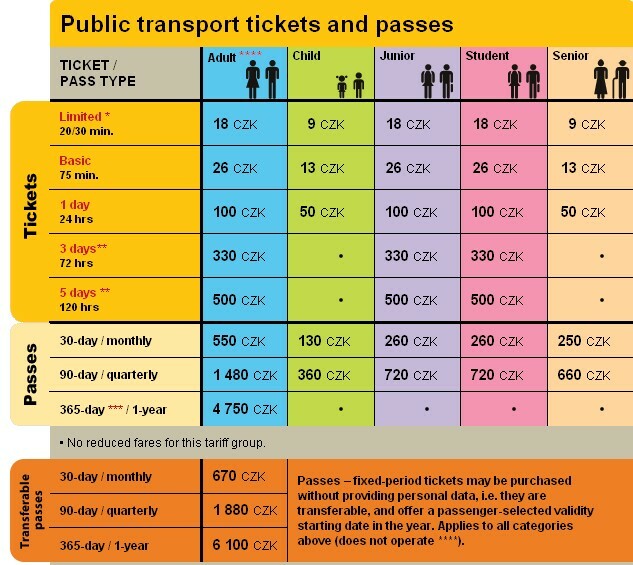 There are all kind of tickets for the public transportation; single tickets, day passes, three day passes and five day tickets. Outside these you can also buy monthly, three monthly and a full year pass. Tickets need to be validated before entering into the metro system, or as you board the bus or the tram. There are three lines in Prague; a green, a yellow and a red line. The first line starts around 5.00 in the morning and lasts until 24.00. The metros run regularly so there is no need to study timetables! The buses and trams start around 4.30 in the morning and travel until approximately midnight. Between midnight and 4.30 there are some night buses travelling. There is a funicular bringing you up to the Petrin Hill. During main season this leaves between every 10th and 15th minute. Frist trip leaves around 9 in the morning. You can read more about the Petrin Hill here. For a pricelist showing the public transportation in Prague, click the picture on the right.